Gilbane served as construction manager for the University of Texas Southwestern Medical Center at Dallas’s (UTSWMC) new biotechnology building project. UTSWMC’s “BioCenter at Southwestern Medical District” supports the technology transfer efforts of the “Office of Technology Development.” The University required a high degree of flexibility in the design of this field of dreams project to accommodate a variety of Biotechnology enterprises. The facility provides lease space for start-up ventures to serve the spectrum of the biotechnology and biomedical device industry. The sixteen foot floor-to-floor height and integrally designed mechanical penthouse allows for the distribution of utilities above ceilings to maximize usable square footage. This design allows any available square foot to be used for either laboratory or office space. The building’s exterior materials are in keeping with the contextual vocabulary of the existing UTSWMC campus. Sustainably designed, while not submitted for certification, the project could potentially obtain LEED® Silver status. Ample fenestration using highly efficient insulated glazing accommodates daylighting of the interior and visual connectivity of the occupants to the environment. 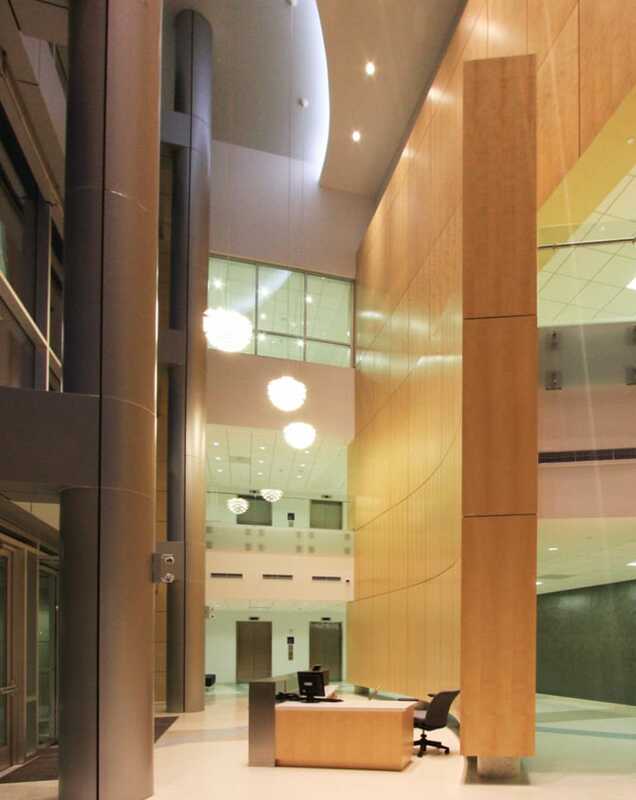 Collaborative spaces, the large break area and vertical circulation lobby for instance, are located along the transept circulation corridor to enhance purposeful and chance meetings of researchers. The interior finishes, selected for aesthetics and durability, work with the spatial experience to promote an inspirational environment; witness this in the relation of three story reception lobby to the transept circulation corridor. The flexibility of the building both in programmatic function and mechanical systems provides for the rapid fit up or renovation of spaces to accommodate new users. The laboratory module is conservatively established to provide anywhere from 363 square foot labs with ample bench space to as much as 35,000 square feet of contiguous laboratory space. From the structural grid to the exterior glazing the dimensional control is a reflection of the laboratory module. The wide main corridor and abundantly sized dual purpose service/occupant only elevator allows for secure equipment move-in without impairment to personnel circulation. The routing of utilities overhead rather than in a service corridor maximizes the usable square footage; which in turn reduces lease rates. The functional flexibility of the building can support both the wet and dry sciences and any given non-support square foot can be any configuration of laboratory or office and the distribution of looped utility, air and exhaust systems can be easily configured or reconfigured to accommodate the high churn rate generally experienced by a facility with this purpose.